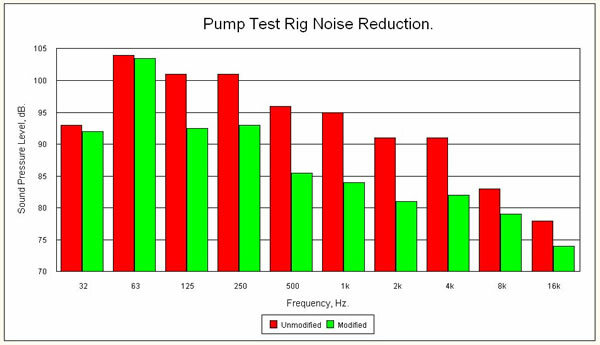 A pump motor test rig for marine diesel fuel injectors generated an operator noise level of 100dB at maximum load. The noise level at a second operator position was 96dB and 94dB in the remainder of the workshop area. Detailed noise and vibration measurements revealed that the pump mounting structure and cambox were the dominant noise radiators below 2000 Hz. At 2000 Hz and above, the pump table, injector and injector pipe brackets were the dominant sources. The rig room itself had acoustically “hard” walls, but the ceiling at woodwool slabs provided quite good absorption at 250 Hz and above. The existing structure around the test rig was modified to form an effective partial acoustic enclosure. This included constrained layer damping, acoustic absorbent and some extension of existing covers. In addition, local acoustic absorbent was applied to the walls. Additional local measures included reducing the radiating table area by cutting off an unnecessary section, moving the bracket attachment points and introducing friction plate damping. These measures reduced the noise at the closest operator position by 9dB under the worse conditions, as shown in the graph. The reduction at the second operator position and in the remainder of the workshop was 7dB. The total cost of implementing the modifications was £1800 (1981 prices). Industrial Noise and Vibration Centre Ltd.